After two years of buildup, Apple CEO Tim Cook has announced what he called a "sneak peek" of the programming that his company's content service will include. The new service is to be called Apple TV+, but no pricing or confirmed start date was revealed. 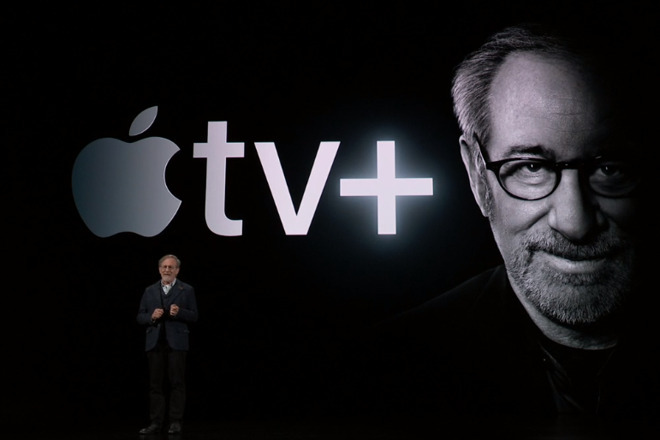 Tim Cook took to the stage at the March 25 event to deliver what he ultimately called a "sneak peek" at the new streaming video service called Apple TV+. In a presentation that was replete with star names, Apple would only say that the service is coming this Fall and be available via the Apple TV app. No pricing was announced nor whether Apple would offer bundles with its existing Apple Music or forthcoming Apple News+ services. The event's headline celebrity was Oprah Winfrey. 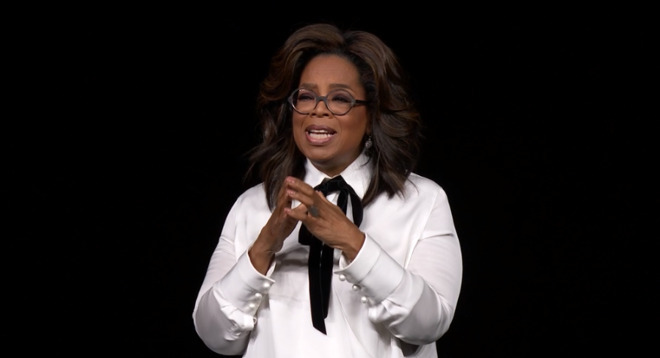 "We have this unique opportunity to rise to our best selves in how we choose to use our technology and our humanity," she said. "To face the daunting challenges of our time. Each of us comes to this Earth with a deep potential that yearns to be fulfilled. We all crave connection, we search for common ground. We all want to be heard but we also need to listen." Greeted by cheers from the audience, she explained how she was making documentaries and also bringing her famous book club to this new service. "That's why I have joined forces with Apple," she said. "Because they're the company that has re-imagined how we communicate. I joined to help serve this moment." Apple is promising to tell the best stories ever told with Apple TV+. The service was discussed by Jamie Erlicht and Zack Van Amburg, alongside a host of Hollywood stars and content producers, including Stephen Spielberg, Ron Howard, and more. Steven Spielberg was the first celebrity guest on stage after the video, and he introduced his forthcoming remake of "Amazing Stories." Jennifer Aniston and Reese Witherspoon then unveiled their drama "The Morning Show," which is about a news programme and the people who work on it. "You can't have a show about the dynamics between men and women without a male," said Aniston. "I am happy to provide the manliness!" said co-star Steve Carell. Jason Momoa and Alfre Woodard introduced "See", a new science fiction drama written by "Peaky Blinders" creator Steven Knight. "It asks the question, how much of our experience in life is visual," said Woodard. Other shows unveiled included a new preschool series about coding and a music comedy/drama called "Little Voice" by Sara Bareilles and JJ Abrams. "We're honored that the absolute best lineup of storytellers in the world -- both in front of and behind the camera -- are coming to Apple TV+," said Eddy Cue, Apple's senior vice president of Internet Software and Services, in an Apple press release. "We're thrilled to give viewers a sneak peek of Apple TV+ and cannot wait for them to tune in starting this fall. Apple TV+ will be home to some of the highest quality original storytelling that TV and movie lovers have seen yet." Apple announced the hiring of Jamie Erlicht and Zack Van Amburg on June 16, 2017. The pair are former Sony Pictures Television executives, as co-heads of video programming. Previously the two were responsible for programming like "Breaking Bad" and "The Goldbergs." "It will be an honor to be part of the Apple team," said Erlicht in a statement at the time. "We want to bring to video what Apple has been so successful with in their other services and consumer products -- unparalleled quality." It will clearly be high quality, and have much to offer. The roll out is great. I feel stupid for saying this, but when I see "+" at the end of it, I read "+fee." Maybe I missed it, but I don't think they got to what that is specifically. The only thing that was missing was the mad cow. I turned it off. A two hour event and pricing was announced for only one thing...magazines. No details on this new gaming or TV subscription service. No info on pricing for content provider subscriptions signed up for within the TV app. Way more questions than answers at this point hence why the stock is down. Oprah? LOL. Apple TV+ sounds like it's going to be trash. Honestly the Apple Credit Card was the most exciting announcement. The rest of the stuff is stuff looks standard fare B List Actors and Directors. Probably just save my money and watch it grow in the Apple Wallet app. Spielberg is B List? Abrams? Howard? Hahaha okay, wow. Nobody is forcing you to watch Oprah’s documentaries, but get real. It felt like "We've got Paul McCartney, The Rolling Stones, The Who, Bob Dylan, U2... they are all going to create cutting edge music you've never heard before. The greatest artists of our time creating music especially for you!!!" The truth is that most of these people on stage today are past their creative prime and are just cashing in on the deal. The stock fluctuates a few bucks every day, no sign today is any different. You’re saying there was a sell off today because they didn’t announce pricing? Good grief. The whole market is down. Abrams couldn't resurrect the Star Trek franchise even after cheating with an alternate timeline. He's B-List Director and that's being kind. Spielberg has been primarily doing Executive Production duties he's not Directed a lot projects lately. I have faith in him but we'll see. There were no Chris Nolan's up on stage. Shamaylan is another B-List Director. With the talent Apple brought up there's no way they can claim they have the best talent. Witherspoon and Oprah's last movie bombed. Apple is down 2% but the Dow is flat. Both Amazon and Netflix are up. I do think this is Wall Street giving Apple a big meh. Especially when no firm availability or pricing was announced. Or anything really groundbreaking. Apple TV+ is better not be more expensive than Netflix. Exactly what it felt like. When they mentioned the Rolling Stones as a viable music magazine I almost fell over laughing. Apple should have never have gotten rid of Forstall. He was the only one that came off with a young spirit. Apple Execs are getting downright Geriatric. On the nose there, I think. “Couldn’t ressurrect”? The first two Star Trek films were box office smashes, even if the third underperformed a bit. Second one was the highest grossing Star Trek move of all time. You’re smoking crack. Chris Nolan is in the middle of a 2020 project right now. Great, Oprah's involved. Now I know why the iPhone is so expensive, 30% goes to her. Nothing presented today is anything I'm remotely interested in. Yet another streaming service. I'll happily stick with my $80/mo Uverse+internet. I mostly watch youtube anyway. Apple has jumped the shark. You’re both right. Today’s event is a solid look into the future... and those who are paying attention know this was a huge step in the right direction. Apple Card/News/TV/Arcade are services that will move the stock. But without pricing and detailed launch dates, it’s difficult to buy/sell shares at this quarter’s juncture. By default, the market is dissapointed... so what. what some may have missed is Apple’s commitment to a culture of positivity and inherent good. This is a long term strategy that I believe is not only morally good, but will sustain financial prosperity as well. Refer to the event’s focus on artists, storytelling, family-friendly options and Oprah. The future is bright! Apple today came out with solutions looking for problems. Nothing was new, groundbreaking or didn't already exist. Yawn. Actually, the stock always goes down, after every event. AI's Mike said the same. It doesn't matter what Apple announces. Can you please pass the drugs you're smoking? These were some of the most famous, most bankable directors and performers and producers.